Russian-Indian joint development of fifth-generation fighter jet costs $6 billion. The Russian-Indian joint development of a fifth generation fighter jet will cost some $6 billion, Hindustan Aeronautics Ltd. (HAL) Financial director D. Shivamurti said. Russia and India signed in December last year a contract to jointly develop a design for a new 5G multirole fighter. 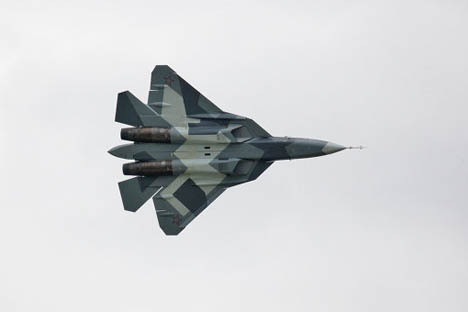 Russia's Sukhoi holding and India's Hindustan Aeronautics Limited agreed in early 2010 to jointly develop a fifth-generation fighter jet based on the T-50 design. "A detailed design phase, including the cost of the project, is likely to cost more than $6 billion," Shivamurti said. "The work between us and them [India and Russia] will be distributed in a 35/65 proportion." Russia has been developing its own fifth-generation fighter since the 1990s. The current prototype, known as the T-50, was designed by the Sukhoi design bureau and built at a plant in Komsomolsk-on-Amur in Russia's Far East. Russia is planning to use the jointly-developed 5G fighter as an export version of T-50, while India is expecting the new fighter aircraft to enter service with its air force by 2020.